An echocardiogram is a test that uses sound waves (ultrasound) to create images of the heart. A Doppler test uses sound waves to measure the speed and direction of blood flow. By combining these tests, a pediatric cardiologist gets useful information about the heart’s anatomy and function. Echocardiography is the most common test used in children to diagnose or rule out heart disease and also to follow children who have already been diagnosed with a heart problem. This test can be performed on children of all ages and sizes including fetuses and newborns. Echocardiography diagnoses cardiac problems, and also guides heart surgery and complex cardiac catheterizations. Children’s developed one of the first digital echocardiography laboratories in the world and remains a leader in the development of new technologies to optimize patient care. Our digital echocardiography laboratory makes it seamless for physicians throughout the region, country, and world to instantly send Children’s cardiologists echocardiograms for review 24/7 from any computer. The team also provides advanced connectivity services, such as digital echocardiography and tele-echocardiography. What problems can echocardiography diagnose? Echocardiography is utilized to diagnose cardiac problems, as well as guide heart surgery and complex cardiac catheterizations. Children’s developed one of the first digital echocardiography laboratories in the world and remains a leader in the development of new technologies to optimize patient care. Our digital echocardiography laboratory makes it seamless for physicians throughout the region, country and world to instantly send Children’s cardiologists echocardiograms for review 24/7 from any computer. Children’s team offers inpatient and outpatient echocardiography, as well as sedated procedures. The ultrasound test is done with your child lying down comfortably on a bed or examination table. Infants may be able to lie in their parent’s lap. The test is done by a cardiac sonographer (a technologist with extensive training in ultrasound) and/or by your pediatric cardiologist. The examiner will put a few stick-on patches called electrodes on your child for (EKG) tracing during the exam. He or she will also put a small handheld device (called a transducer) on the chest and abdomen. It sends and receives the sound waves and is connected by a cable to the ultrasound machine. The ultrasound machine is a computer that converts sound waves to pictures. A small amount of clear gel is used between the transducer and chest to make sure there is proper contact. The gel doesn’t stain and is wiped off when the test is over. The examiner may select and show a variety of pictures on a TV screen. You’ll be able to see a picture of the beating heart, and you may be able to see and hear the flow of blood. The picture normally changes when the transducer is moved. Expect to hear loud sounds from the ultrasound instrument. Portions of the test may be recorded on videotape or stored as computer files for later measurement, interpretation and storage as part of the patient record. Echocardiographic examinations take 20 to 40 minutes. It is important that your child remain still to obtain an examination of acceptable quality. Younger children often require sedation to allow your cardiologist to obtain a complete study. In some instances, children may be comforted by watching a videotape or DVD. If sedation is needed, your child will be asked not to eat or drink for several hours prior to testing. Prior to giving medicine, a physician or nurse will make sure there are no reasons why sedation should not be given (i.e, bad cold) and then explain the procedure to you. Children usually fall asleep within 30 minutes and sleep for about an hour. Even though sedated echocardiograms are very safe, close monitoring of heart rate, blood pressure and oxygen is performed while your child is asleep. When your child wakes up, he or she may have poor balance (may last for more than an hour) and should be watched closely. Your doctor and nurse will continue careful observation until your child is fully awake and tolerating juice or milk. Older children and teenagers usually don’t need sedation and may enjoy watching the test. To avoid any anxiety, be sure your child knows that the test is fun, that it doesn’t hurt, and that you or whomever brings your child to the test may stay in the exam room and watch. Except for allowing for the possibility of sedation, you don’t need to make any special preparations. Having your child wear a shirt or blouse that buttons down the front is helpful. Your child may eat normally before the test; bring a bottle if you have an infant or a video for your child to watch. This is the simplest type of echocardiography, and produces an image that is similar to a tracing rather than an actual picture of heart structures. M-mode echo is useful for measuring heart structures, such as the heart's pumping chambers, the size of the heart itself, and the thickness of the heart walls. The Doppler technique is used to measure and assess the flow of blood through the heart's chambers and valves. The amount of blood pumped out with each beat is an indication of the heart's functioning. Also, Doppler can detect abnormal blood flow within the heart, which can indicate such problems as an opening between chambers of the heart, a problem with one or more of the heart's four valves, or a problem with the heart's walls. Color Doppler is an enhanced form of Doppler echocardiography. With color Doppler, different colors are used to designate the direction of blood flow. This simplifies the interpretation of the Doppler technique. This technique is used to see the actual structures and motion of the heart structures. A 2-D echo view appears cone-shaped on the monitor, and the real-time motion of the heart's structures can be observed. This enables the physician to see the various heart structures at work and evaluate them. No. No feeling comes from the sound waves themselves. Occasionally there’s mild discomfort from the transducer pressing on the skin. No. There are no known ill effects of the sound waves used during a standard echocardiogram. 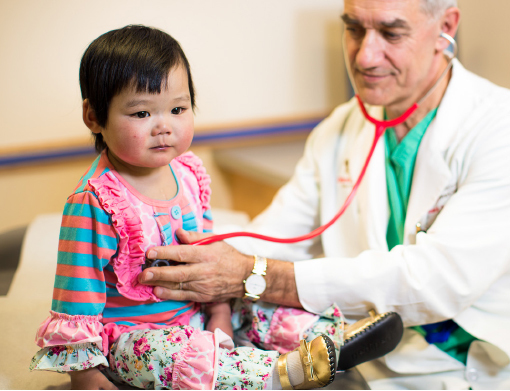 Children's National offers cardiology services at St. Mary's Cardiology Clinic.